CEDRIC-IIE is researching rigorous information system (IS) development. 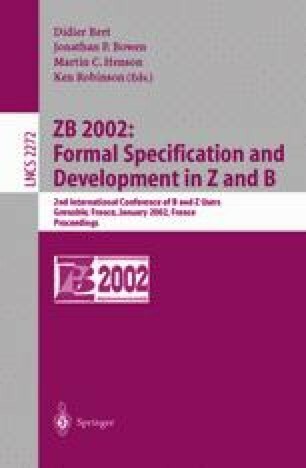 Previous work includes translation rules for deriving a B specification from object-oriented diagrams, metamodels of IS UML structural and functional concepts, and a prototype translation tool. Here we outline the traceability needs for a tool to assist in rigorous IS development, and provide meta-structures for the required links among B and IS UML concepts, in the context of existing translation rules and IS UML metamodels. H. P. Nguyen. Dérivation de spécifications formelles B à partir de spécifications semi-formelles. PhD thesis, Laboratoire CEDRIC, Conservatoire National des Arts et Mètiers, Evry, December 1998. Available from http://www.iie.cnam.fr/~laleau/thesePHNguyen.ps-gz.